An active dog is a healthy and happy dog. If physical limitations or movement disorders – due to acute conditions (surgery or injury) or chronic conditions (diseases, age-related conditions, and obesity) – hinder your dog’s ability to move without pain, discomfort or physical distress, rehabilitation can help restore and/or maintain your pet’s physical capabilities to an optimal level of function. At Pet Health Animal Hospital, we can apply the rehabilitation therapy to a whole host of diseases and conditions related to the canine musculoskeletal and neuromuscular systems. The following, however, are the most common conditions successfully addressed with rehabilitation therapy. Postoperative Cranial Cruciate Rupture Surgery – One of the most common orthopedic conditions in dogs, cranial cruciate ligament disease typically eventually requires surgery to repair the ligament. 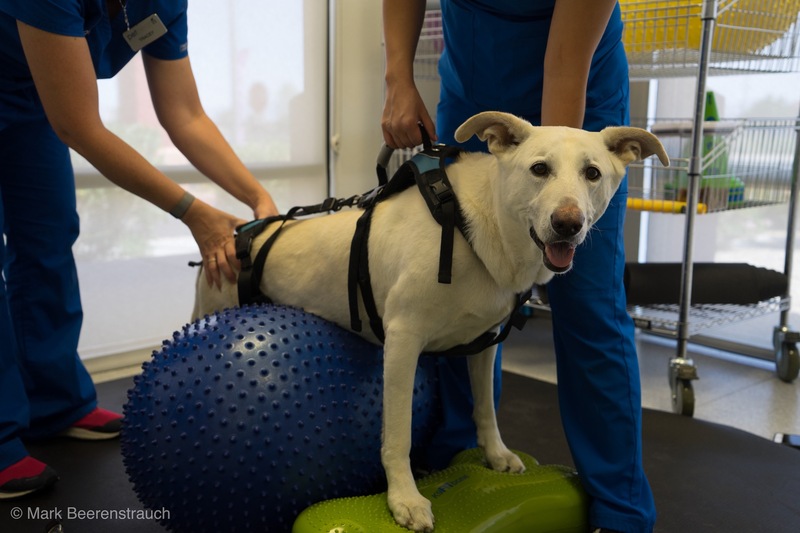 Post-operative rehabilitation is essential to restoring normal function to an affected dog. Postoperative Femoral Head and Neck Ostectomy – A number of conditions and injuries (including coxofemoral luxation, femoral head and neck fracture and Legg-Calvé-Perthes disease) require this type of restorative surgery. Rehabilitation therapy reduces pain during recovery, accelerates healing and helps restore normal function. Spinal Cord Diseases – If a dog is diagnosed with spinal trauma or a spinal disease such as inflammatory disease, degenerative myelopathy or intervertebral disc disease, then goals for rehabilitation would include managing pain, maintaining joint mobility, restoring/preventing muscle atrophy and coordination and improving proprioception (body-position awareness). 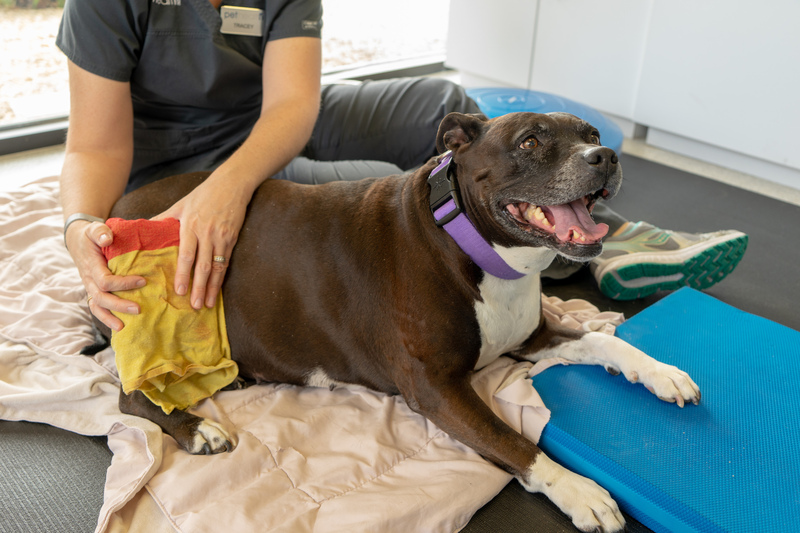 Osteoarthritis – Since this condition often makes movement difficult for dogs, it causes them to be more sedentary, which in turn worsens the condition by causing weight gain and muscle atrophy. Assisted exercise allows the dog to strengthen muscles and remain active without putting pressure on sensitive joints. Obesity – One of the most common canine health concerns in the United States, an estimated 50% of dogs between the ages of five and ten are considered either overweight or obese. Obesity leads to a number of other serious health problems such as cardiovascular disease, diabetes and heat intolerance. Canine rehabilitation allows obese dogs to burn calories, build muscle mass and lose weight on a set schedule to return to a healthy weight. When considering a patient as a potential candidate for canine rehabilitation, our veterinarian will consider your pet’s general physical fitness (orthopedic and neurological health) and also perform a more specific thorough examination of muscle mass, strength, joint mobility and stability, range of motion, scar tissue formation, laxity, flexibility and pain. After performing a thorough health assessment, which in addition to the physical evaluation might also include x-rays, scans, blood tests or other laboratory work, our veterinarian will collaborate with our rehabilitation specialist to devise a safe and effective treatment plan to target the patient’s specific physical conditions. The more thorough the physical examination and specific diagnosis, the better the treatment plan. With a detailed diagnosis of the patient’s condition, abilities, and limitations, we can create a more directed care plan to address the dog’s individual needs. When devising your pet’s treatment plan and implementation, our veterinarian and rehabilitation specialist will always consider the scientific evidence and study-based recommendations for your pet’s condition before prescribing or implementing rehabilitation plan. Your pet’s treatment plan will include rehabilitation therapies and modalities, an implementation schedule and an at-home care regimen. Depending on your dog’s specific condition, we will apply a combination of treatment interventions based on their scientific indications for use (for example, pairing a treatment with a specific condition or body part). The various therapies recommended for your pet will work harmoniously, complementing each other to deliver compounding health benefits to your dog. Stretching – Improves and restores range of motion. Medical Massage – Reduces pain and inflammation by improving circulation, while also preventing the formation of scar tissue. Passive Range of Motion Exercise – Moves joints through their normal range of motion without bearing weight or contracting muscles. Commonly applied following surgical procedures. Joint Mobilization – Skilled hand movements targeting key joints and muscle groups to improve extensibility, decrease pain, reduce swelling, and increase the range of motion. 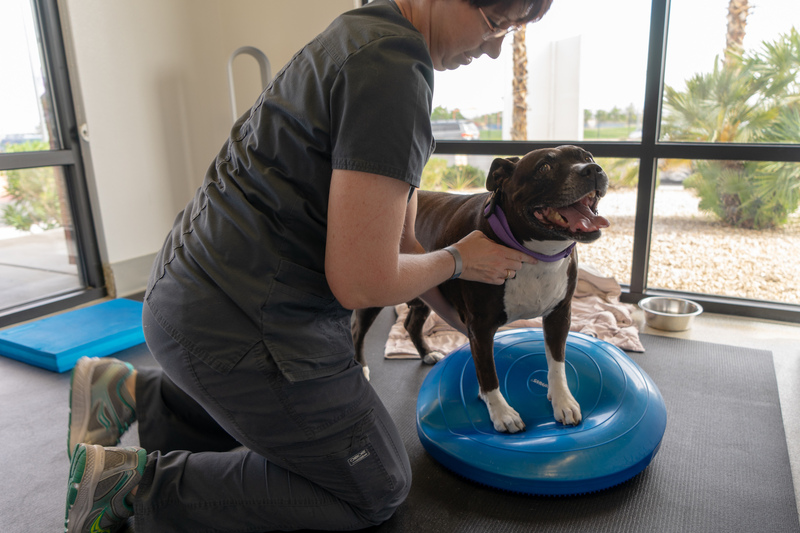 Balance Therapy – Used to help pet regain balance, strengthen affected limbs, improve proprioception and understand that a healed limb is no longer painful, incorporating slings and stability balls. Walking Exercises – Improve almost all aspects of physical function for pet, including the encouraged use of affected limbs. Pets may be walked on leash or with the use of land treadmills. As pet improves, challenges, such as stairs, uneven surfaces or an incline, might be gradually incorporated. Hydrotherapy – Performing exercises in water is effective for several reasons including buoyancy, hydrostatic pressure and water resistance. The buoyancy allows your pet to strengthen muscles under the effect of decreased weight. Hydrostatic pressure (the pressure of the water surrounding your pet) helps reduce edema (inflammation due to the pooling of body fluids). Water resistance creates a gentle challenge for your pet, increasing muscle strength as he or she moves limbs through the water. Cavalletti Rails – Horizontal bars placed at increasing heights and varying patterns to create challenges which increase stride length and range of motion while improving balance and proprioception. Low Level Laser Therapy – Has been shown to reduce inflammation, manage pain and accelerate healing. Cryotherapy – Application of cold to manage pain and prevent inflammation. Heat Therapy – Application of heat increases circulation and manages pain. Therapeutic Neuromuscular Electrical Stimulation (TENS) – Artificially stimulates the contraction of muscles to improve strength and range of motion. We aim to establish a treatment plan which will achieve the fastest and most positive outcome for each patient. Rehabilitation plans require patience, perseverance and flexibility, as every dog is different and will respond differently to treatment. After a diagnosis is reached, we work with pet parents to establish reasonable treatment goals and end points to help guide each pet’s rehabilitation process. 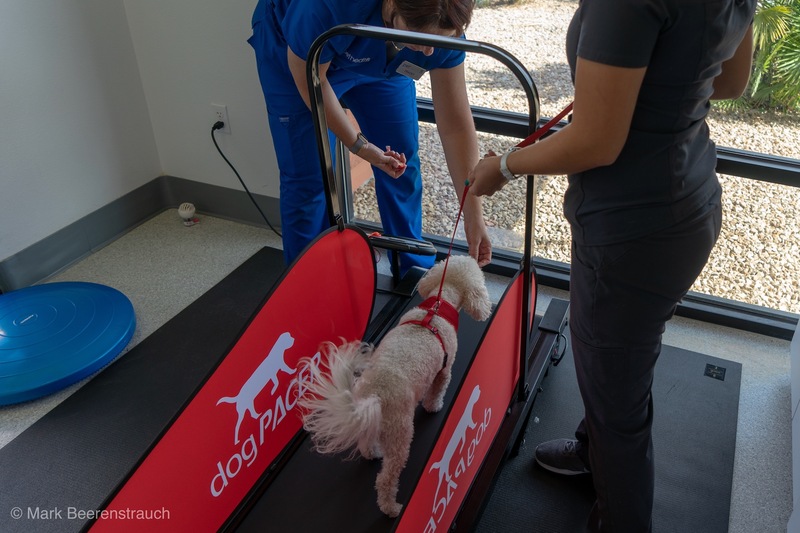 Once a plan has been outlined, we begin rehabilitation exercises and treatment modalities with low intensity and duration, and then we progressively increase intensity and duration as your pet’s healing and tissue strength improve. As your pet improves, our rehabilitation specialist will modify your pet’s treatment based on weekly health assessments. 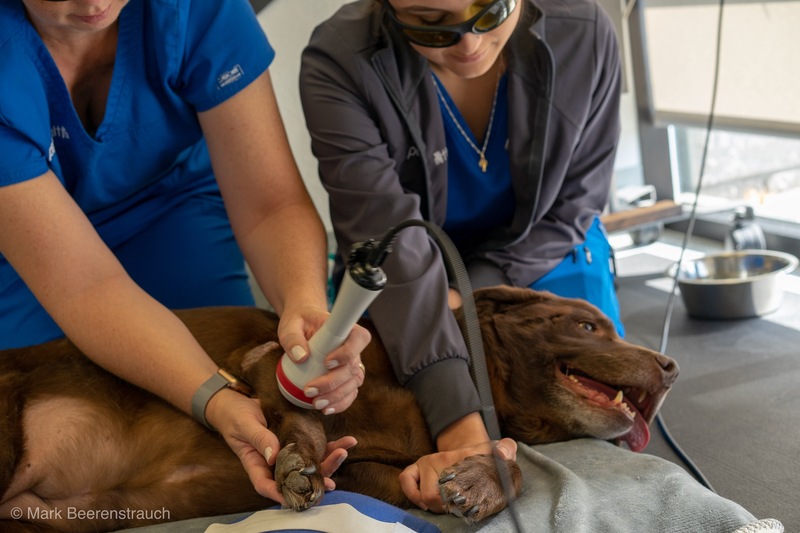 Weekly appointments with Pet Health canine rehabilitation specialist aim to keep your dog and his or her treatment plan on track to meet recovery goals. Carefully following an at-home care plan is integral to your pet’s recovery, as daily exercise is essential to healing and strengthening. We work with pet parents to teach them an exercise program they can practice at-home with their pets between appointments to continue strengthening muscle structure and mass, increasing joint range of motion and flexibility and improving balance and proprioception. Performing your at-home care plan as often as prescribed will be a key component to your dog’s successful recovery.